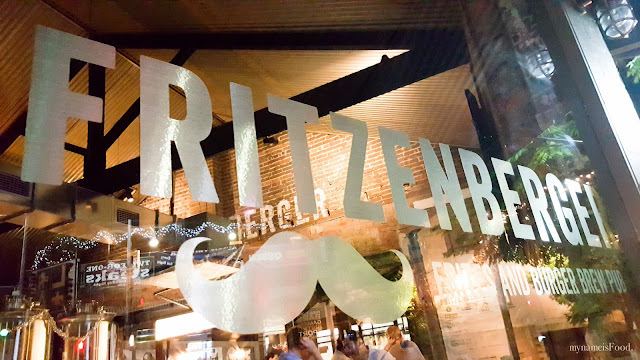 Fritzenberger, Petrie Terrace, Brisbane - my name is Food. The combination of burger and fries is delicious and I'm sure many would agree. With simple menu of burgers with a variety of sides on offer as well as bringing fresh produce sourced from within a 100 km radius. 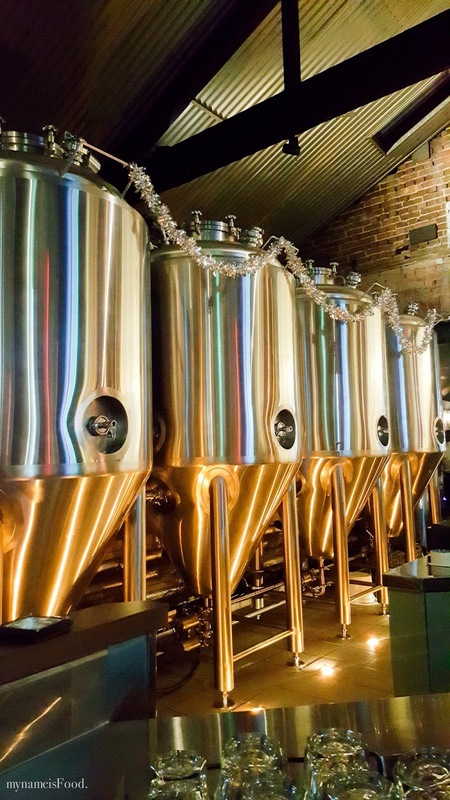 What's most interesting would be having an on-site microbrewery which allows you to have a selection of local and international bottled and tap beers. Although you may think it is just another burger joint, they do organic ketchup made in-house and their beef patties are made from a mixture of grass-fed, dry aged chuck and brisket from the Byron Bay hinterland. 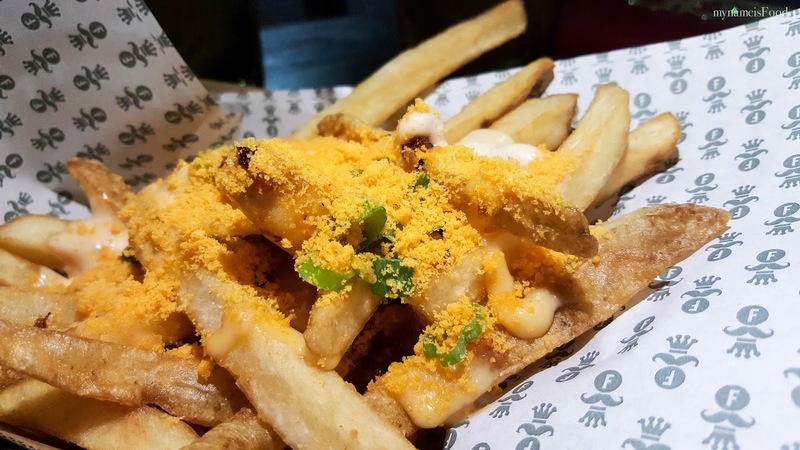 Starting off our meal with 'Loaded frites' (AUD$10) topped with cheese sauce, green onion, candied bacon, Fritzensauce and Twisties salt. Yes, you heard right.. Twisties salt. 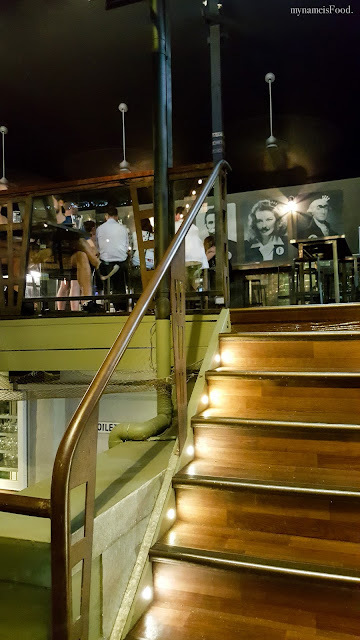 If you would like to add more salt or seasonings, they do offer a salt station on one side of the open kitchen where you can choose from Vegemite salt, Vinegar salt, Roast chicken salt and so on. If you're not a biggie on fries, they do have Crumbed pork bites or Fritzen chicken wings with blue cheese sauce available. 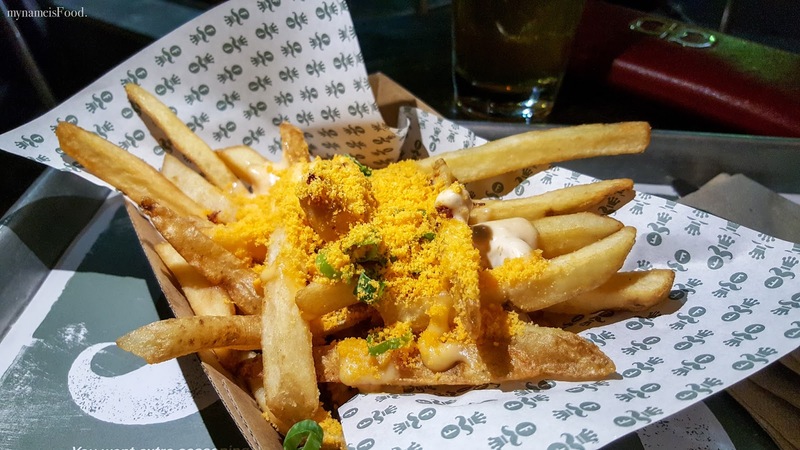 The chips, what I liked about them was that the potato skins were on, cooked well but could have crispier on the outside. As for the Fritzen sauce, I wasn't too sure of what I was suppose to be tasting but the Twisties salt however did remind me of a packet of Twisties which I thought was fun. 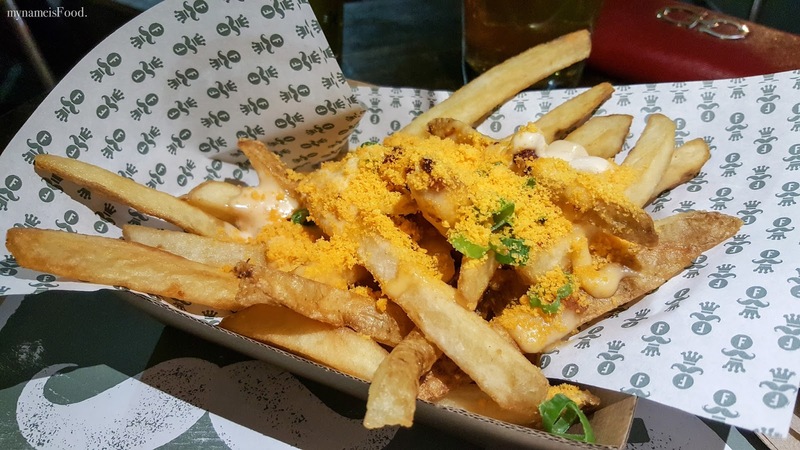 Having the green onions and cheese sauce was a great addition however, more cheese sauce would've been great as the topping were only placed in the middle and the rest of the chips did not get a dip on them as when you start eating it one by one, you don't realise that the topping has dissapeared along with the chips on the top not leaving anything behind for the rest. 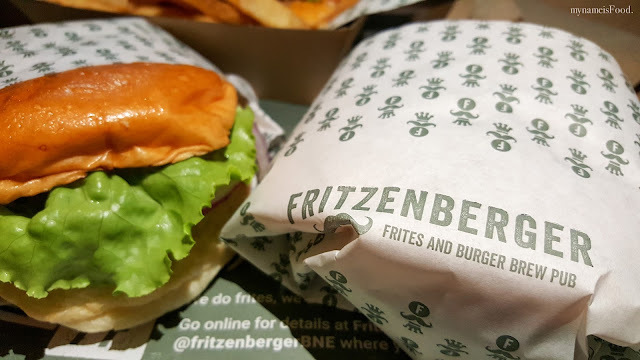 'Fritzen Burger' (AUD$11) was grass-fed beef, aged cheedar, hydroponic lettuce, organic tomato, spanish onion and their house made Fritzen sauce. 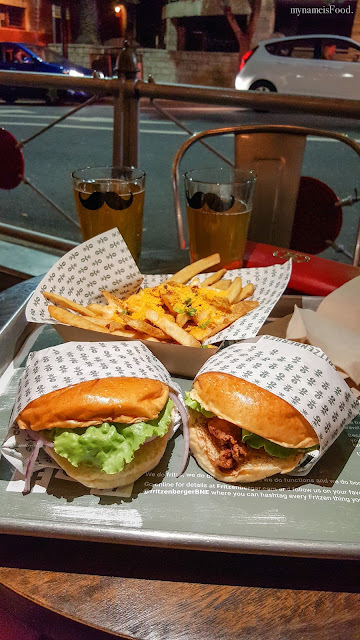 Although we did nearly buy their cheese burger but we thought we'd give their signature burger a try. 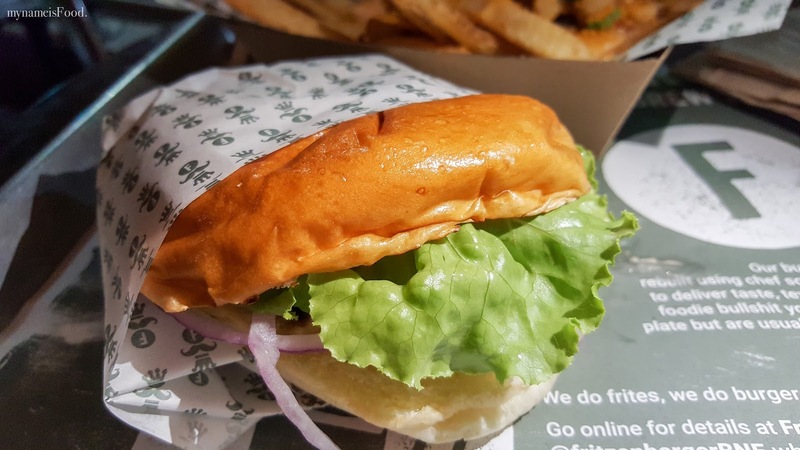 The patty was quite juicy but wasn't the type that would melt in your mouth, it was quite oily actually. The bun was slightly on their dry side but it was a soft brioche bun though I did feel that the bottom bun was too thin to hold the filling together properly. 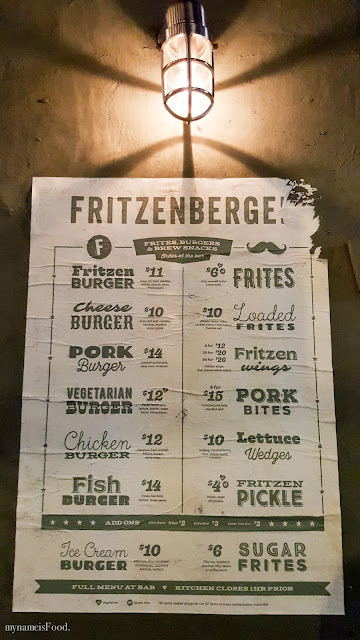 It is rather a simple burger but usually when we do try a new burger joint, their signature is always mandatory, very important in other words to try. 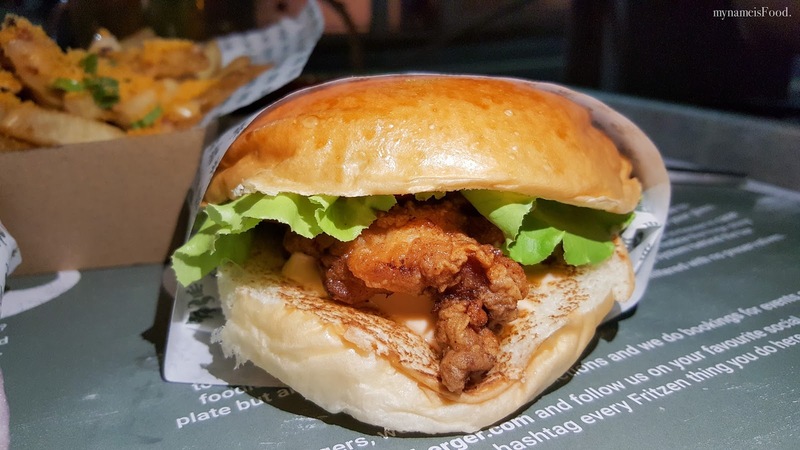 'The Chicken Burger' (AUD$12) was something that caught my eye other than their original signature burger which has southern-fried, free range chicken thigh fillet, hydroponic lettuce, organic tomato and spicy mayo. Unfortunately, there was only one piece of chicken fillet which didn't cover the whole burger bun which was quite disappointing as when you are biting around the burger, you wouldn't get any of the chicken but only the lettuce, tomato and a little of the sauce, you would get the chicken however when you start biting near the middle. 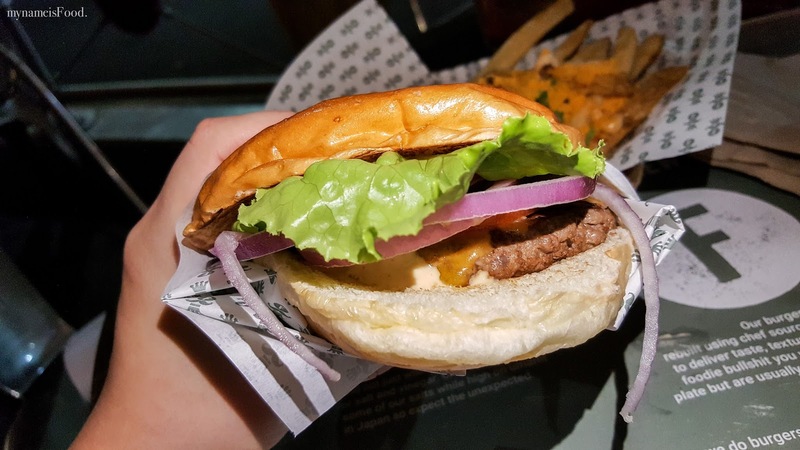 The lettuce was nice and crispy though again, only one strip of lettuce. 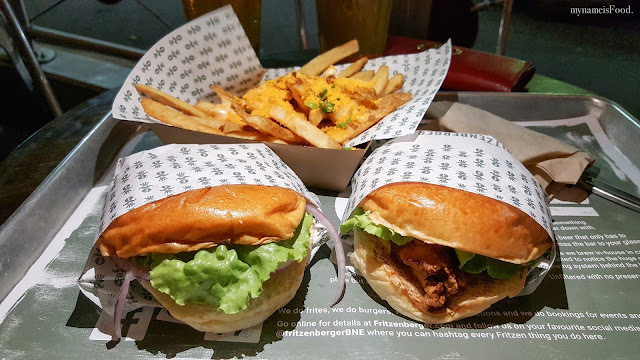 It would've been much better if the chicken did fill the whole area of the burger allowing you to have a bit of everything in every bite. 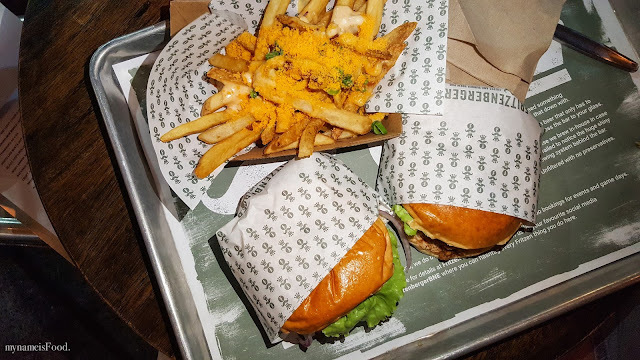 The addition of the spicy mayo instead of normal mayo or the usual Tomato or BBQ sauce was a nice touch and gave the burger that bit of a zing. 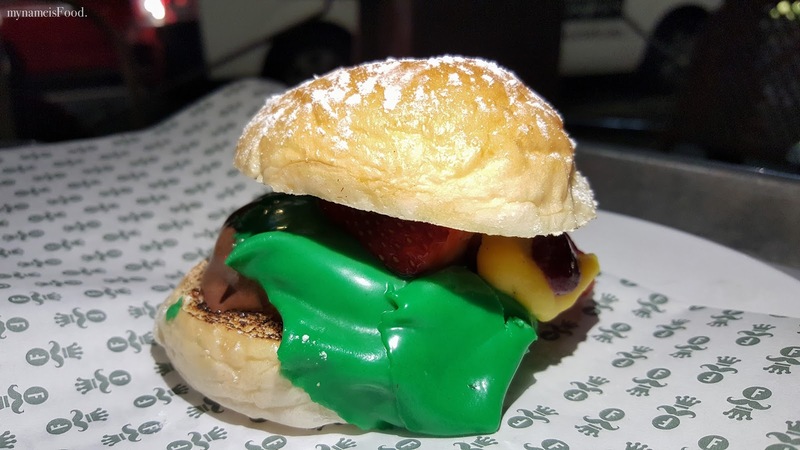 I guess what everyone has been wanting to know or read about would be about this last special dish, 'Ice Cream Burger' (AUD$10). Since the hit of continuous uploaded photos in social media, many has started to come in and dine to try this dessert burger. 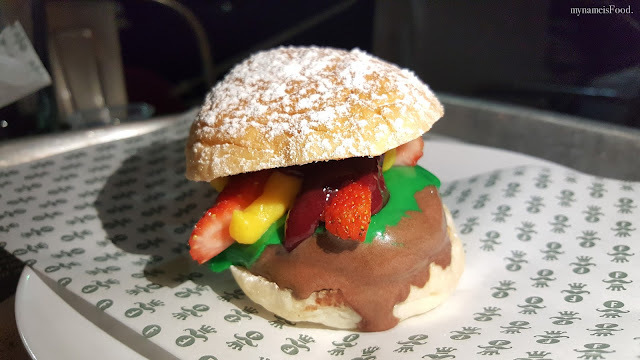 A petite milk bun dusted with icing sugar with a dark chocolate ice cream patty, raspberry ketchup with a few bits and pieces of various sweet fruits. Definitely something you don't see everyday..
One thing that was a downturn was the filling melting ever so quickly. As soon as it reached our table, the dark chocolate ice cream has already melted as well as the sweet green lettuce. 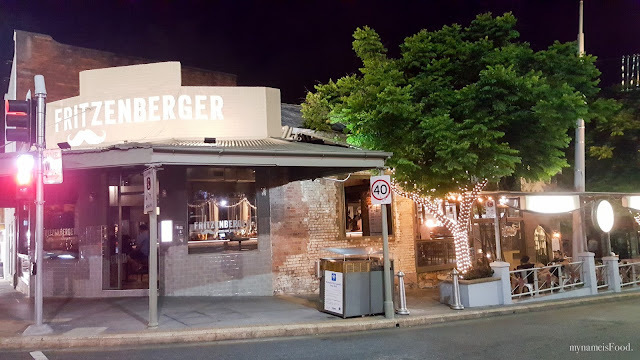 I had a talk with one of the waitresses and they did inform me that many of the diners also had the same comment regarding the dessert burger melting quickly. 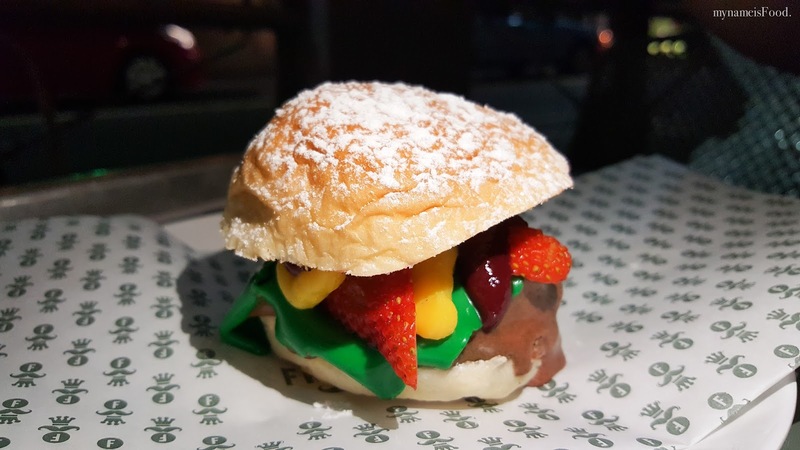 As soon as you tried picking it up, the ice cream would start dribbling down your fingers, the fruits would go sideways and the thin sweet green lettuce would start sliding off as you can see in the photo below, it has all tilted sideways. Apparently during winter, it wasn't as bad and everything was able to hold itself together well. However, maybe due to the heat of Summer and so on may have affected the dish. Though I did wonder, it was quite chilly when were there but it still melted like crazy. 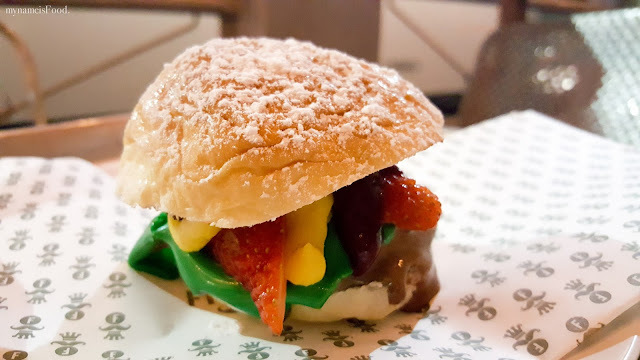 I have had other dessert burgers where its fillings has held itself well even if there was heat around. I quite liked how the sweet milk bun had a slight char on either sides which gave that hint of smokyness. 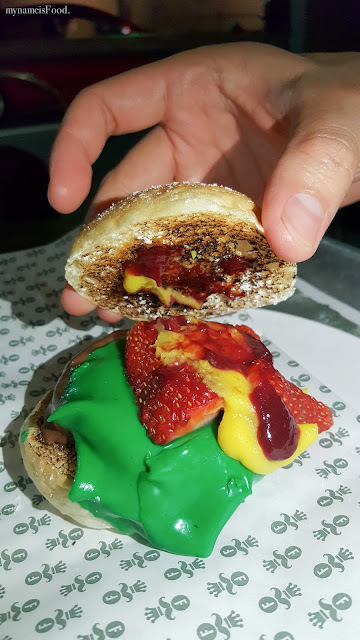 When you do open the dessert burger, it doesn't look as appetizing as what it looked liked in photos or what others have said as it was very messy. Very messy in a way that imaging you have all this ice cream running down your fingers and hands, every bite you make means that the more ice cream will drip down the other side of the bun and the rest of the filling following it not long after. Although very delicious food should be eaten and messy is fine, but having sweet sugary ice cream running down my hands isn't great. Sadly, for me, it wasn't a very pleasant dessert burger to eat. Finding as soon as you leave The Barracks area, simply look in front of you, cross the road and you will find yourself here. With high ceilings and open windows looking onto the street allows the fresh air to come in. The main design of the whole interior is very industrialized with shiny brew tanks and bare bricks. 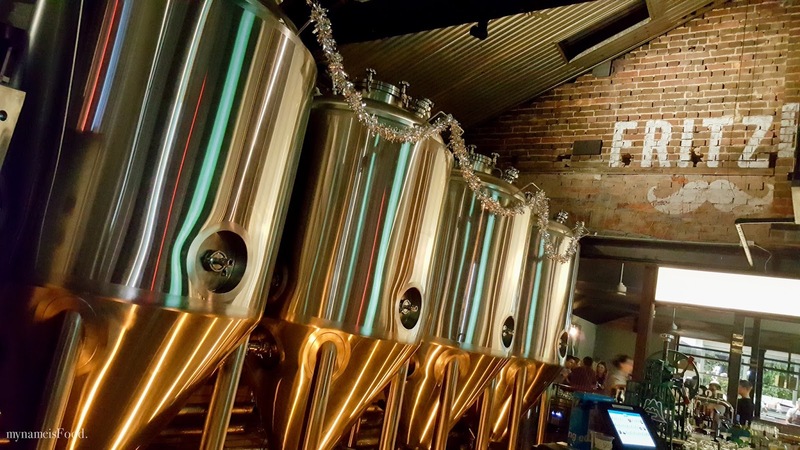 Behind the bar, there lies their on-site craft brewing where there are about six and up to twelve beers being brewed. 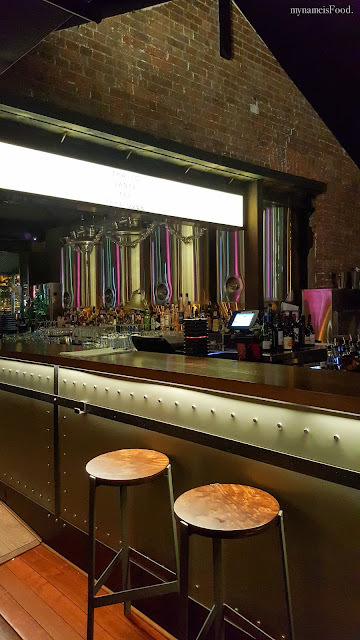 There are plenty of seating around even bar seatings if you would like a more casual fee. 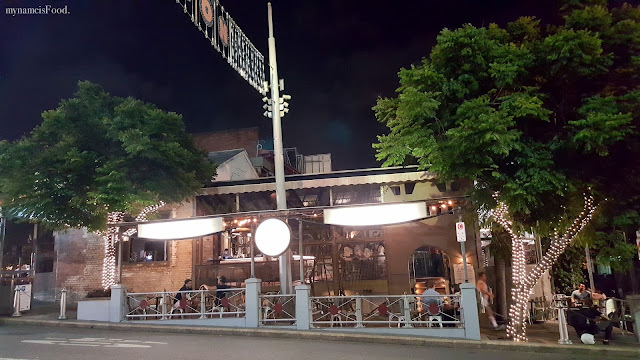 I didn't get a chance to go downstairs and have a look at the seating but there are seatings outside where we decided to sit as the weather was rather nice that night. *mynameisFood. 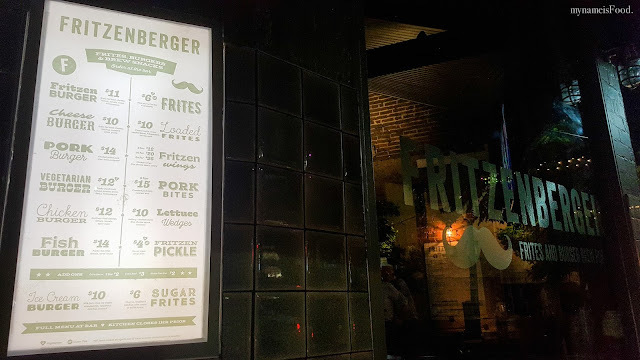 was invited to dine as a guest of Fritzenberger, as always, all opinions are my own.